One of my favorite things about blogging is the connections that you make through it. I am in an amazing group of Christian bloggers and I reached out to them asking for a few guest posts. I have a special treat for you today because the post that I received speaks deeply to my heart as a mama. Recently, I have come to the awareness that I can be a grumpy, complaining, and ungrateful stay-at-home mom. This is the job God has set for me and is such a clear purpose for my life right now. Yet many days I have allowed a critical mindset and attitude to overcome the joy that can be found in such a job as this. Well, I am done with that. I am ready to move on and to be grateful for this incredible job I have been given. From laundry, to dishes, to playing on the floor, to cooking meal after meal... this is the work that I have been entrusted with. 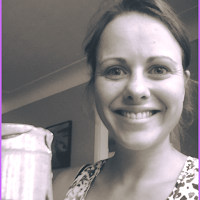 I have decided to find joy in my life as a stay-at-home mom because it IS a choice to do so. There are so many ways to find joy in your everyday tasks. It is simply a matter of taking the time to find those ways and to see how you can bring about your own 'voice' to each task in front of you. 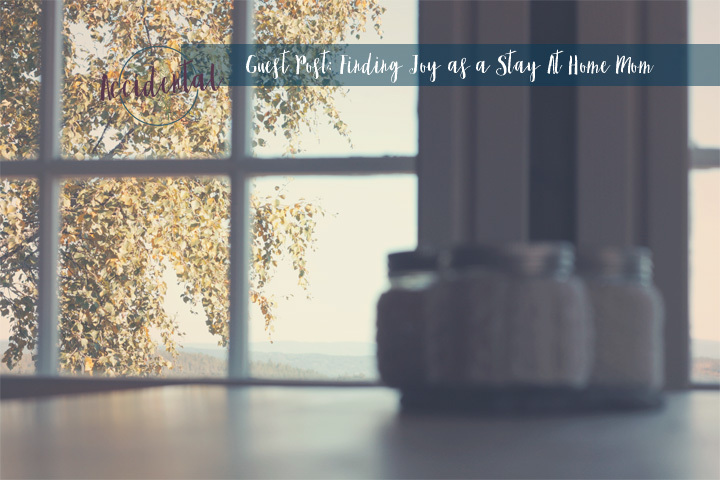 The following are ways that I am choosing to find joy in my every day mundane tasks as a stay-at-home mom. These ways work for me because they allow me to express myself as who I am -- for you, the ways that you can find joy in your everyday work may look completely different. It is entirely dependent on what brings you happiness, a feeling of success and accomplishment, and gives you the ability to creatively express yourself. As I cook my meals each week I am learning more and more how much I love to prepare and cook good food for my family. I love trying out a new recipe and it turn out to be absolutely delicious. I also love knowing how I can best bless my family with healthy and yummy recipes. In no way do I call myself a cook --- I am still learning and I still love to use my crockpot or any other incredibly simple way of cooking. But adding a bit of creativity to my cooking allows me to grow in my cooking skills and please my family. I do this by having a set meal plan each week so that I do not dread deciding what to eat each day (See post Making a Meal Plan Work) and picking one new meal to make each week. 2. Set tasks completed each day. 3. Hosting and Reaching Out to Others. I love hosting, but I can be a lazy host. Being a lazy host brings me a feeling of discouragement and failure. By keeping my home open to guests, having snacks and/or appetizers to offer along with coffee and tea, and by keeping my home presentable I am more prepared for whoever might come through the front door that day. And that is how I want to be. It gives me a feeling of joy to have people feel welcome in my home. Along with that, being a stay-at-home mom gives me more time to reach out to others than I might have otherwise. Whether it be through making a meal for someone, taking care of someone's kids for a day, simply sending someone a text...etc. These are ways that I am able to easily reach out and be a support for someone else. 4. Focus on Daughter's Playtime. (see post on Intentional Play) I love making up fun and unique activities for my daughter's playtime. This does take extra effort and planning but it brings me joy to see her learning through these activities and enjoying them. By taking the time to plan new activities weekly for my daughter, I am using my skills as a teacher in my work as a stay-at-home mom. I miss this job and I am thankful that I can still use my abilities at home. 5. Making Home a Place of Love, Peace and Joy. This can be done through music, lit candles, cleanliness, baked goods, coffee brewing, dinner ready, and most of all through my own attitude. Filling my home with a sense of joy always begins with me. All of these things take effort --- finding happiness in your tasks WILL take effort. It is easy for me to become lazy and not take any of these tasks as seriously, but when I take the work and effort into them the results are incredibly worth it. Above all, I know it pleases my Saviour to do so. This post first appeared on A Beautiful Alarm. Esther is a Canadian writing from Hamilton, Ontario. She is a stay-at-home to two incredibly sweet, but crazy little girls, a wife to a very hard-working husband, a writer in her ‘spare’ time, and a teacher at heart. Most of all, she is a follower of Christ and is working on living in His joy through every task of motherhood. You can find her at http://facebook.com/abeautifulalarm or at http://abeautifulalarm.blogspot.ca/ where she writes about waking up each day with an attitude of joy and thankfulness while working on living a life of intention and purpose for Christ.